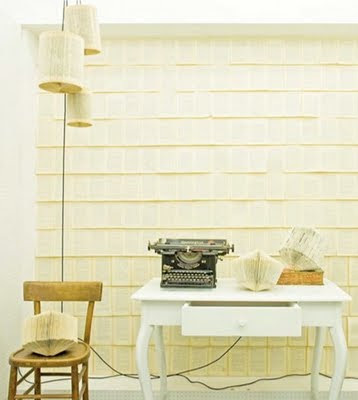 This is part of a project, mostly in Europe, called Project Book. Old, about to be discarded, damaged books were given to artists to make art with. These are examples of what they made, although they also made sculptures that were huge, tables, etc. 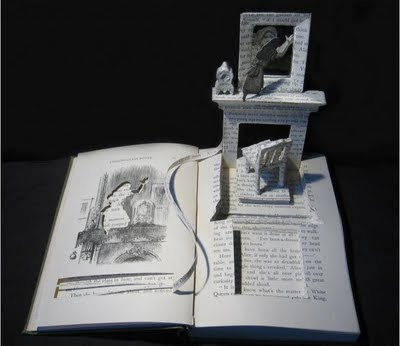 I find these folded and cut books the most interesting. 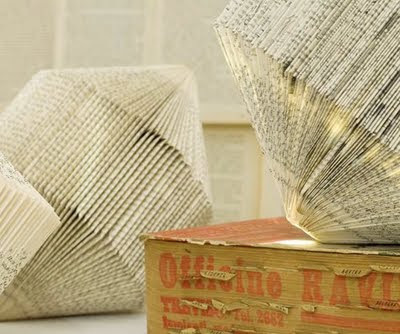 These are pendant lights made from a book that has simply been folded. 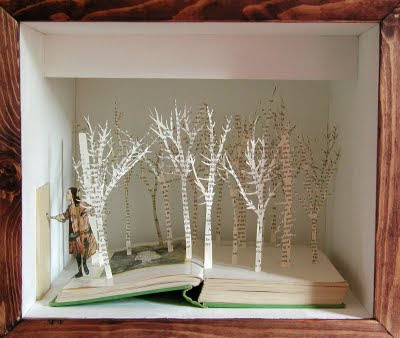 This is a forest cut from the inside of the book. 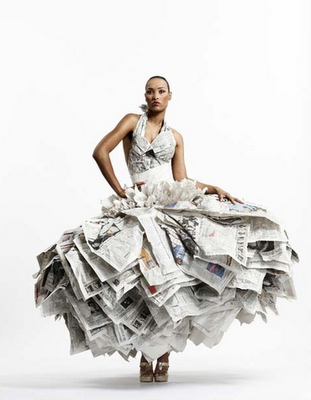 This is newspaper formed into a dress. Great texture. 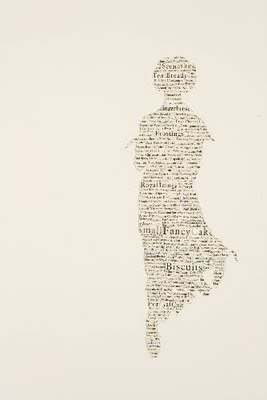 This heart is cut from book pages. 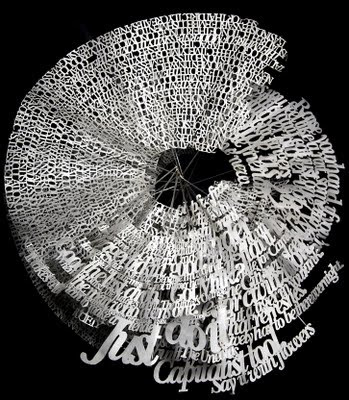 Words cut into sculpture. Not sure what the words say. 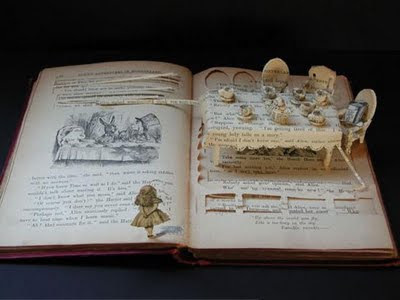 Three dimenional Alice in Wonderland. 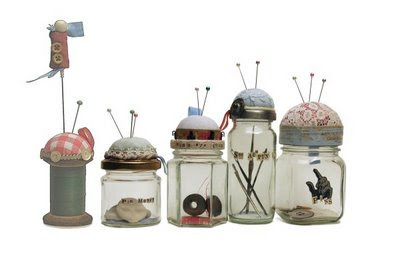 Don't you just love these pin cushion storage jars. A 2 for one winner. I'm intrigued with the idea of making orbs with my fiber lace technique. 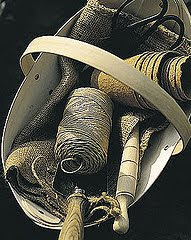 I know I could wrap the fiber around a round object such as a balloon and then pop the balloon once the fiber was dry. Need to play with that idea. 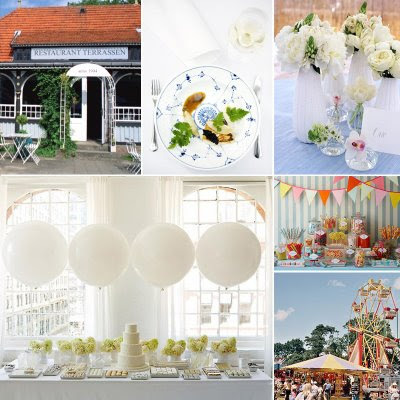 These are just pretty pictures that caught my eye. Here's a fiber orb put to great use as a lighting fixture. Very Cool. 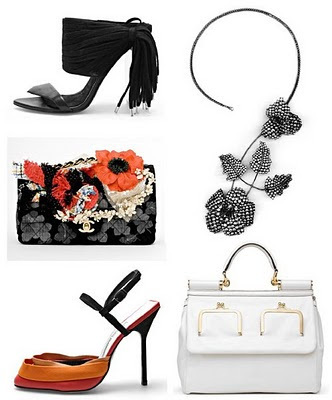 I'm loving the fiber purse and the necklace in this grouping. The necklace seems to be a neck wire backwards allowing the necklace to flow as it does, and the fact that it appears to be fiber is very cool and summery. The purse is a lot of things all thrown onto a simple clutch. I love the wall behind the bed, the room itself not so much. I think this is done with tape and paint because it doesn't appear to have any dimension. Great looking. 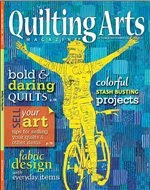 Before we get to the fiber thing....isn't this cool, sculptural, great for a collection, fiber intensive? Love it and the possibilities is provides. 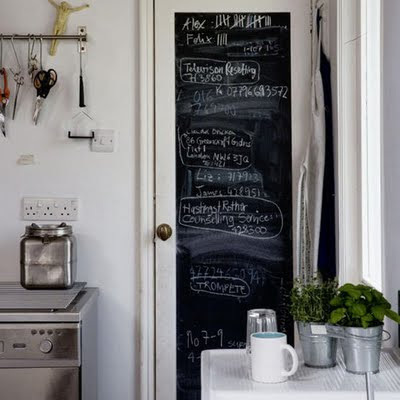 Still talking about the chalk board, black board door. I meant to add this picture the last time I mentioned it. What a great idea. Must Do. Now - for the fiber. 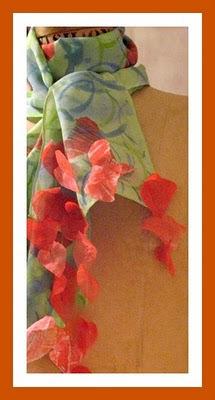 This is a Valentine Scarf I gelatin monoprinted for The NEST. It will sell for $28.50 on our web site and on etsy. We are adding a shopping section to our website along with a connection to etsy. We will be featuring gelatin monoprinting kits, complete with scarves, paint, brushes, gelatin, directions and great ideas of what to do. We've also made hand painted tea towels and painting smocks to name a few of the other things. Interested or intrigued? You can see the beginnings of our shopping section at http://www.experiencethenest.com/. You might also be interested in the workshops we're conducting in Charlottesville, Va. in March. If you love fiber, you'll love this. 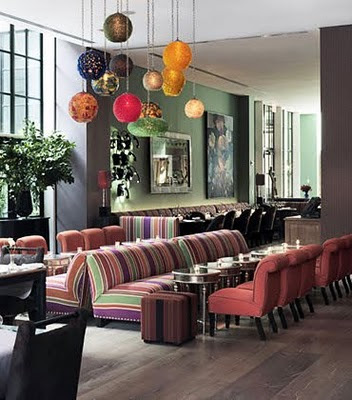 Look at the cool use of patchwork fiber on these couches. Unexpected and contemporary at the same time. My guess is it is wool. The two couches appear to be in different colors also, yet somehow they really work. 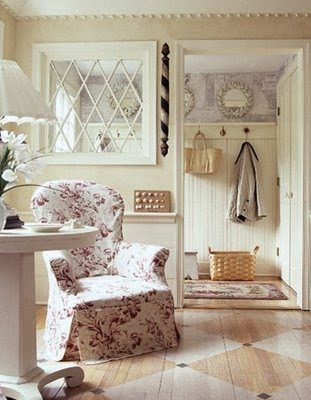 I also like the mix of floral curtains, antiquities, and contemporary. Here I love the mish-mash of colors in the lighting. The jumble of textures works so well to give it a real one of a kind feel to each of the lights. If they were all the same we would yawn. 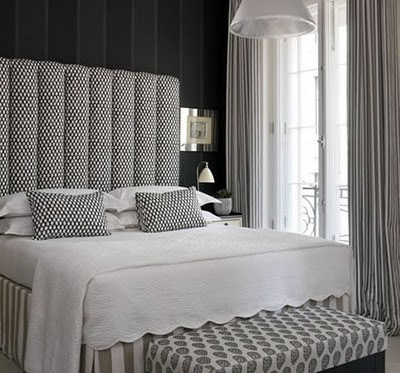 I really don't care for this bedroom design, but I DO love the fiber on the bed. 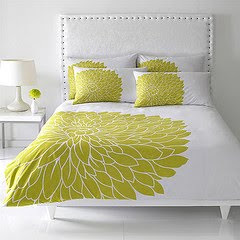 Chenille seams give this bed spread great texture and allow for others colors to come into play. Great use of fabrics. Here's another great use of a textile as framed art. I also love the colors. This quiet bedroom is so lovely in it's simplicity. I'm loving those black walls. This is a hotel in Scandinavia. 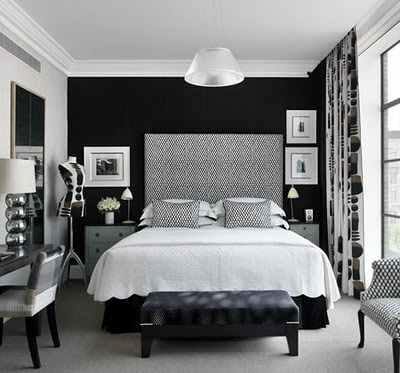 Here's another black wall - great looking. How about that great dress form in the corner. Makes me want to upholster one and I have many around here. I live in an 1880 farmhouse in Virginia. My laundry "room" is an addition that was thought of after the invention of electricity, but not much. 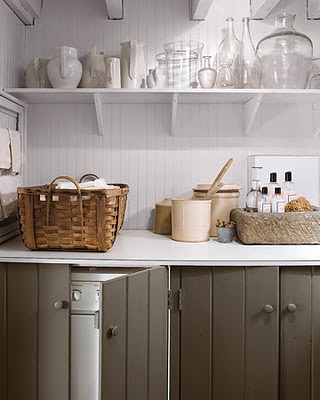 This room appeals to me as a great way to update my laundry room and yet have it keep the character of the house. The walls are already beaded, so it would not take much to redo. 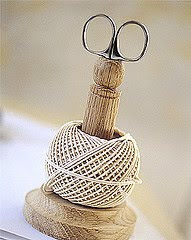 As a fiber artists this is very appealing, both because it is simple and because the design is so pure and clean. Love it. See you in The NEST!! While strolling thru the net I noticed I was coming across several string pictures. Nice.. Neat.. String. In this one the container caught my eye. It's simple, easy to make and efficient. 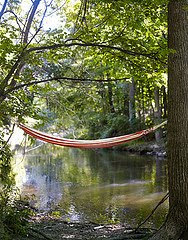 I might even make one, even though I only use string in the garden. 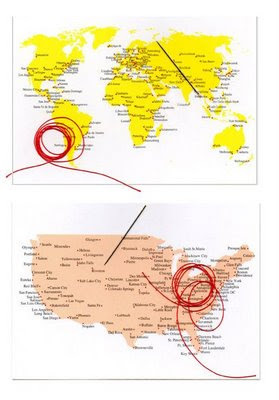 This was just another picture of string I came across. Looks like upholstery supplies. 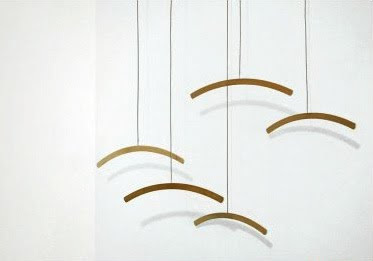 These are not string, but really cool hangers. I spend a lot of time with my clothing trying to find great ways to display them in galleries, in window displays and for photos. Mannequins, hangers and racks are lacking - the clothes never look as good as they do on people. And I've even suspended hangers on fishing line trying to accomplish this. I wonder where I could find them or what I would need to make them. Any ideas? 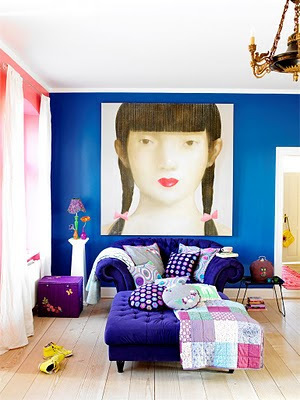 I LOVE this room - I LOVE the really large painting of the girl - the colors -Everything. 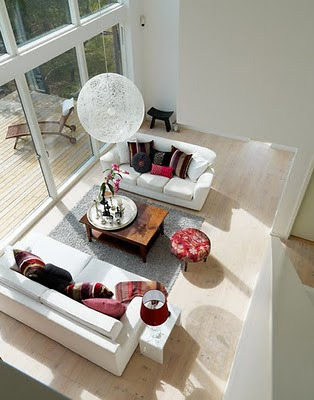 Here's another great floor in a very comfortable room. Nice. 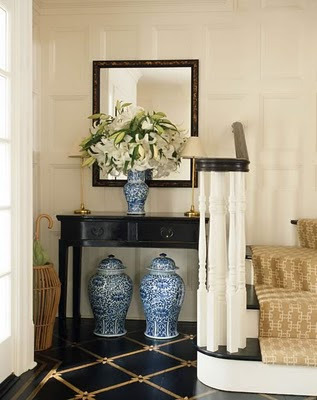 Notice the wonderful molding around the top of the room. 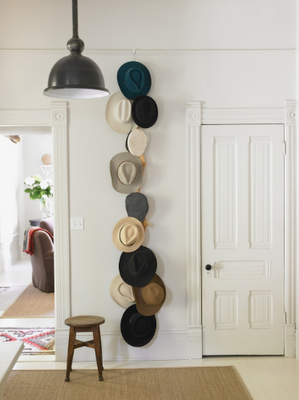 How simple and unusual. I'm not sure it it's just round balls or part of a molding piece, but it looks great. Another painted chalkboard door. I really need to do this. This is a Louis Fireplace Slipcover by ridiculousdesign.etsy.com. Hand painted, trompe d'oeil, art on your wall. 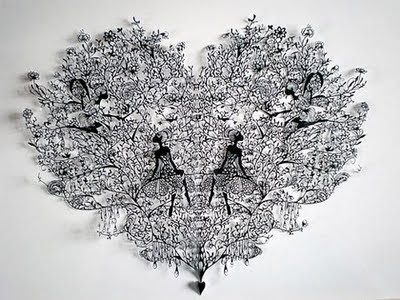 As a former decorative painter (25 years in the businesss) and a lover of all things unique and arty, I love this. 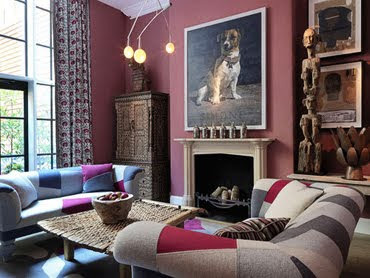 Painted on canvas, it's unexpected and unlike anything I've seen and look how great it looks and fits in this contemporary room. 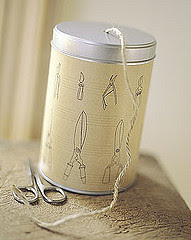 Remember sewing cards? You have to be fairly old to remember having these to play with and I am. I saw this and remember how much fun I had with them in my pre-real-sewing days. I think they'd be fun to make. This is just the cutest nestette ever. 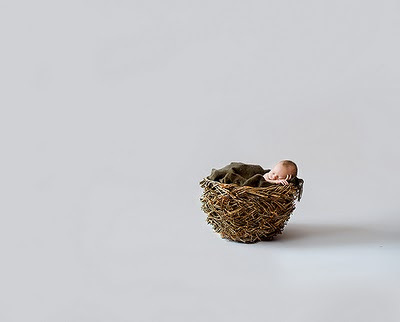 The NEST could use a nestette in it's pictures. 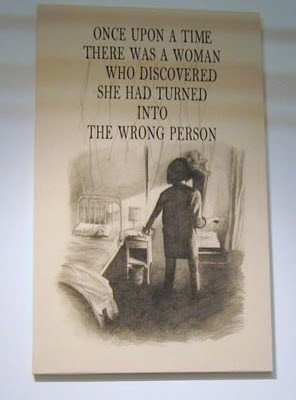 I don't know where this came from, but it really resonates doesn' t it? 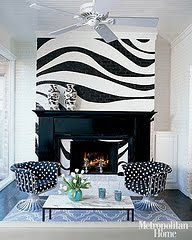 I really love the bold, clean statement of this room defining fireplace. It's fun and fabulous. I love the simplicity and color combo of this dining room. It is adjacent to the living room I showed you in a previous post. I'm really not a purple person, but this combo is very livable. 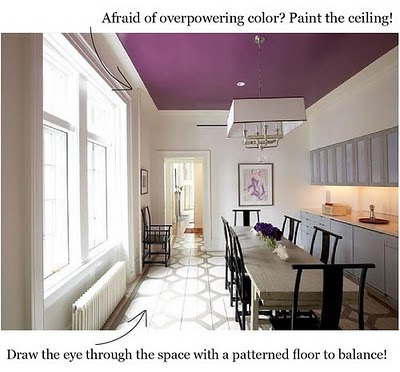 I need to repaint my kitchen floor. I live in a farm house and I love the painted floor, but between the dog and the years, it is wearing away. I'm considering these as influences for how to repaint my floor. The one above is just a little too bland. What I have now is very colorful. 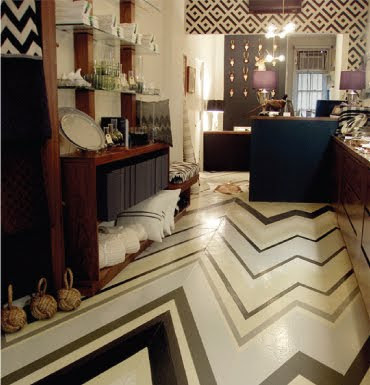 This floor would look great in my entryway. You need to know, I've painted over many kinds of surfaces over the years. Painted wood, linoleum, etc. Paint , if prepared properly, holds up really well. The kitchen floor of mine wore away mostly from dog scratches when she ran to the front of the house to the front door everytime she heard a sound. I love this in this location, a retail store, but I think it could make me dizzy or misdirect me first thing in the morning. Each of these photos make me feel good......and warmer. 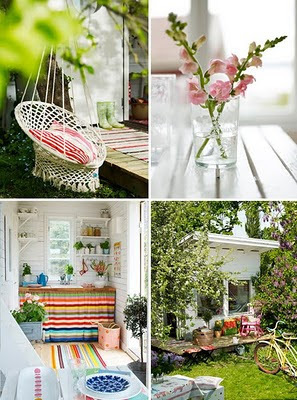 It's been really cold here and this time of year we all yearn to see living, brightly colored, warm weather things. 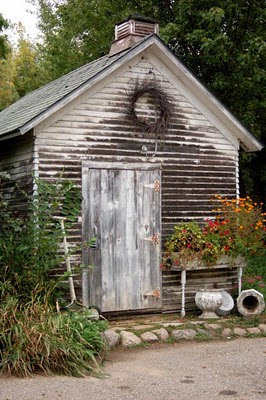 I love the use of the door above for a black board. 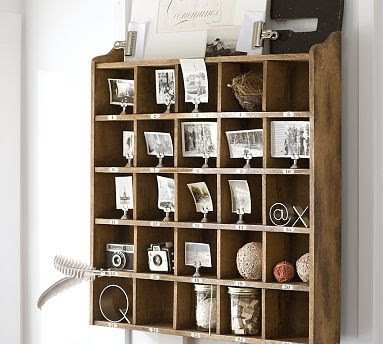 Great for lists, messages, doodles, ideas, recipes and in a room where you always have to look for a pen. Think I'll do that too. I know this has nothing to do with anything else I've been talking about, but this is one of the coolest pictures I've ever seen. It's the bayou at sunset and it seems to have taken on a life of it's own. 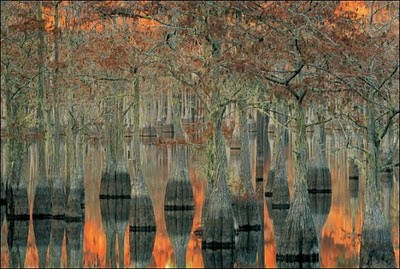 I love what's happened, because of the light, to the trunks of the trees. 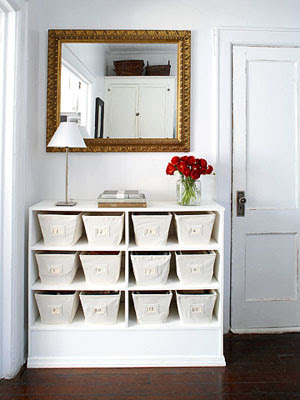 This is another great and good looking organizing idea. Could work great in a Studio. Well, I'll be back tomorrow with more ideas, but right now I'm going to at least start on one of these ideas. I'll show you what I accomplished tomorrow. The new year always brings a desire to organize, redo, spruce up, paint, loose weight, become a better person, change everything you dislike about yourself.......it's exhausting. 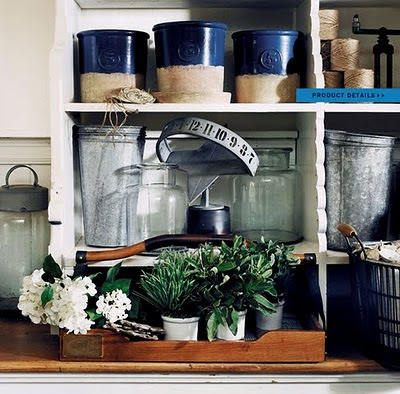 But I do like to look at pictures of perfect organization and great organizing ideas. 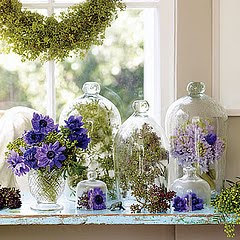 A little bit of spring in this picture......could use some plants around the house. 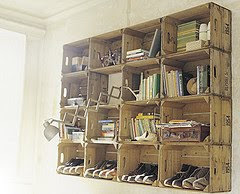 This idea could use some paint for a more finished look, but I do think it's a clever use of crates. 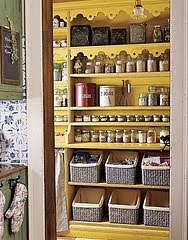 Bet I could figure out what to get at the grocery store if my pantry looked like this.